A simple check book register is very useful for keeping track of your account balances for your home business or personal finances. 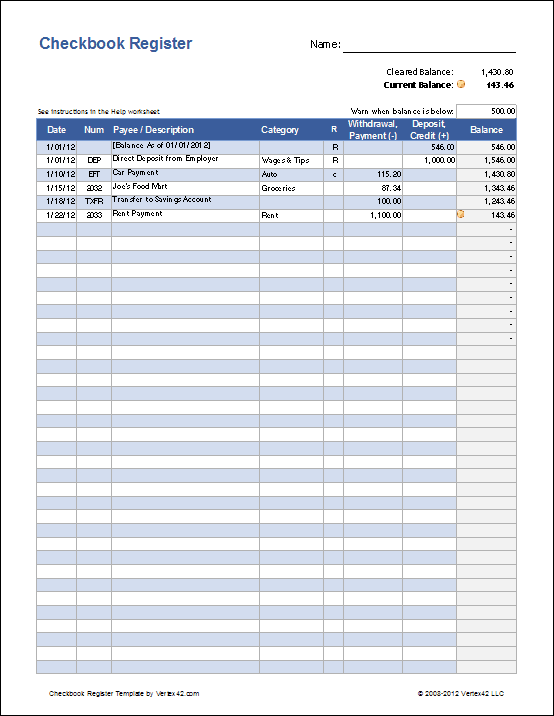 If you'd like a budget-friendly solution, try our free check register template below. It can also be used as an account register for savings accounts and credit card accounts. You can track multiple accounts by making a copy of the Register worksheet. I moved away from relying on the hand-written check register a long time ago, because of debit and credit cards. I don’t carry my checkbook with me, and rarely write checks. I have never liked the idea of somebody being able to see all of my transactions if I happen to lose my checkbook. Instead, I keep track of my account balances and transactions using Excel. See below for the Excel 2003, OpenOffice, and Google Sheets versions. 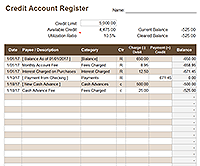 In addition to displaying the current balance of your checking account, we've included a "Cleared" balance total. This is the balance for all transactions marked with an "R" or "c" in the reconcile (R) column. This is useful when balancing your checkbook and comparing it to your latest statement. To make entering transactions faster, we have created an Excel drop down list for the Date column so that you can select the current date. 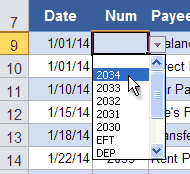 The drop-down list for the Num field will show you the next check number and other options. You can customize this list in the new Settings worksheet. We have included a list of categories from our money management template that you can edit within the Settings worksheet. A user also requested we add a customizable Payee list, so we've done that as well. You can edit Payees that show up in the drop-down by editing the list in the Settings worksheet. 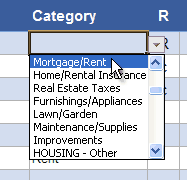 Note: You do not have to use the values in these drop-down lists. They are just for convenience. You can still add a unique value by typing it. You may want to use the Payee drop-down list just for the most common bills. Select "R" for reconciled or "c" for cleared using the in-cell drop-down box. There are many ways to create a running balance for a checkbook spreadsheet, but you'll want something more robust than =previous_cell-payment+deposit. With a simple formula like that, sorting the table and deleting rows can mess things up. The formula we uses displays " - " if you have not entered the Date, and it uses the OFFSET function to prevent the formula from breaking if you delete a row or sort the table. 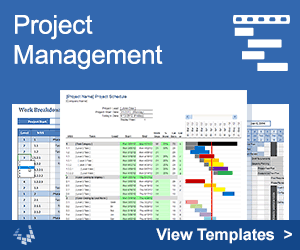 This template is a very simple check register spreadsheet for Excel, OpenOffice or Google Docs. It includes a column for recording expense categories, and the formula used for the Balance makes it easy to add and delete rows. If you would prefer something more advanced that will help you manage a budget, try the Money Management Template. 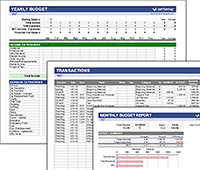 When you want to analyze your expenses by category or create a budget report, that is when you need to make the switch to a more advanced template. There are certainly ways of expanding upon this template, but if you are planning to use Excel to keep track of your personal finances, I would consider using our new Money Management spreadsheet. If you want the ability to import transactions downloaded from a bank and other more advanced features, you may want to try software like Quicken or YNAB. When is this Excel Check Register Useful? Answer: When all you need is to keep track of the current balance in one or more accounts. Example: A college department secretary may need to keep track of the current account balance as a professor gradually depletes her grant money. A history of the transactions is needed, along with a report towards the end of the year indicating how much is left to spend. Checkbook for Excel - www.djicomputer.com - Checkbook for Excel is a full featured software application written for Microsoft Excel and is completely compatible with Excel 97/2000/XP. 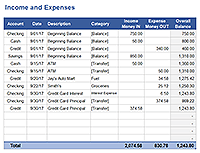 The Checkbook for Excel download provides a fully functional version of program that can be used for 30 days for free. Home Budget Worksheet - A selection of home budget worksheets.